EcoStar Insulation employs the most experienced, highly trained installers in the industry. Spray foam insulation is very specialized, and our people engage in ongoing professional development, keeping up-to-date with the latest products, technology, and installation options. The EcoStar team is at your service – we have expert sales reps, knowledgeable customer-care staff, and competent estimators. Our commitment is to ensure complete customer satisfaction – it means that everyone from tech support to field personnel will be at your service. EcoStar Insulation specializes in Spray Polyurethane Foam Insulation. We believe in the efficacy of the product and in the value of the installation. We install only the best, brand name products on the market, and offer our customers the most competitive pricing in the industry. Spray Polyurethane Foam Insulation (SPFI) is a high performance product, considered to be the best. At EcoStar, installed products are manufacturer warrantied, and installations are guaranteed. 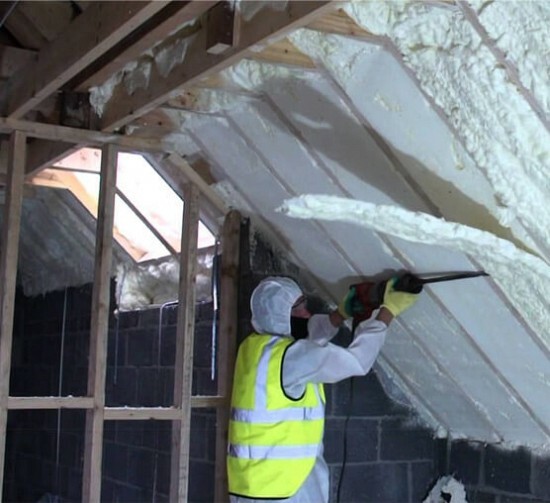 Open cell spray foam insulation is a more effective application than the conventional insulation products because the applied foam conforms perfectly to a given space and seals efficiently. A common install in new builds, renovations, and retrofits, closed cell spray foam insulation seals and insulates like nothing else. The application also serves as an air barrier and vapor barrier. EcoStar also sells and installs blown-in insulation. Sometimes referred to as “loose-fill” insulation, this product is ideal for insulating the attic (and exterior walls). When professionally installed, blown-in insulation creates a uniformly consistent thermal blanket that provides satisfactory R-Value throughout. Blown-in insulation offers a long-term performance and cost-effectiveness.